Dancing tree – Rusty yellow jacket Corymbia leichardtii, Rosie Giblett, Charcoal, ink, pastel on paper, H 120 x W 300 photo by Tonia Cecil. 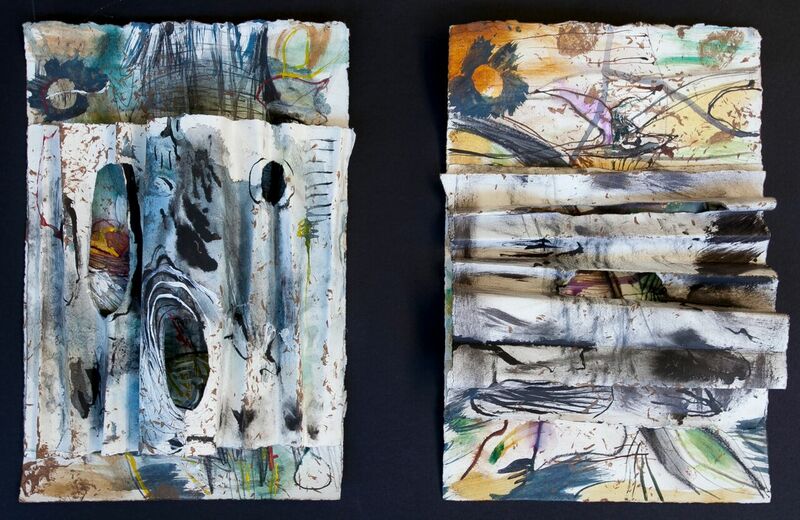 Read on for Rosie’s artist statement and images of her artwork created during her time on the Bimblebox Nature Refuge. Walking in the afternoon light, Heath paddock -Bimblebox, Rosie Lloyd-Giblett, texture rubbings,ink watercolour, H 50 x W 40cm, photo by Tonia Cecil. Bimblebox Nature Refuge is over 1000km from Brisbane with the region under threat from Coal Mining. In September at the Artist Camp I pitched a tent for a week, feeling privledged to experience the opportunity to sleep amongst the Rusty Jacket Corymbia woodlands. Late afternoons were spent walking through the musty pink Heath Paddock, often kneeling to observe natures wonders. 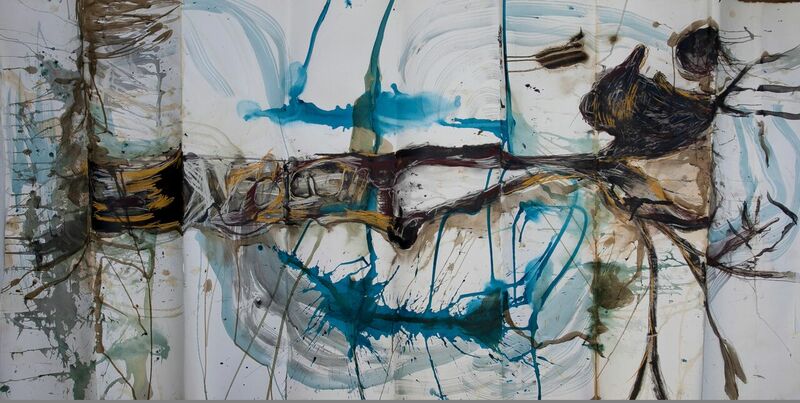 Shadows and Sediments, Rosie Lloyd-Giblett, ink on paper, H 90cm x 70 cm, photo by Tonia Cecil. Poplar Box, Rosie Lloyd-Giblett, charcoal, acrylic on canvas, H 100cm x W 45cm, photo by Tonia Cecil. 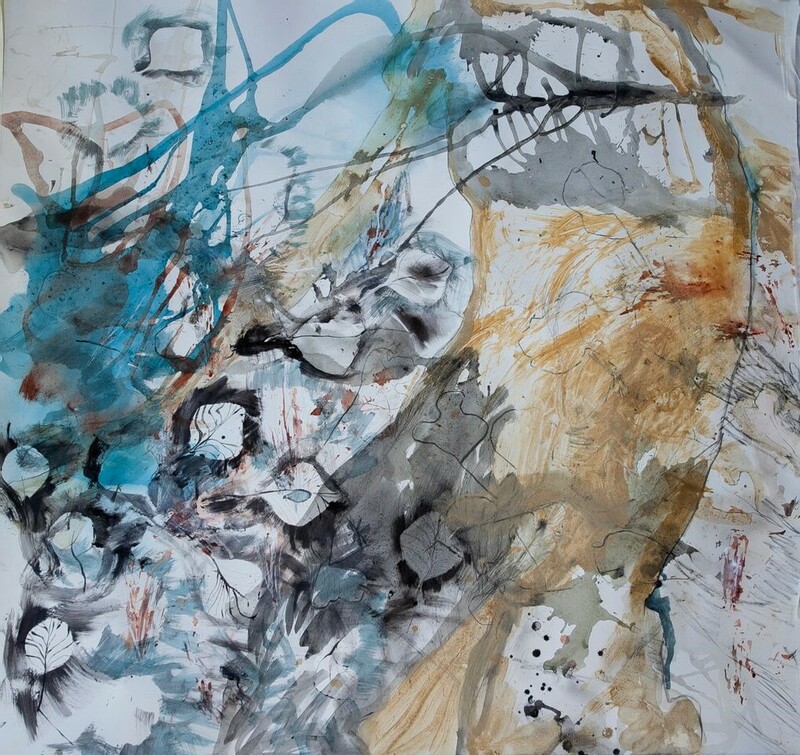 My shadow and the rich sediment, Rosie Lloyd-Giblett, ink, ochre, charcoal on paper, H 130cm x W 110cm, photo by Tonia Cecil. Time seemed to move slowly with shadows forming across my body and the earth. Stepping away from our busy modern world for a moment and having time to be present allows one to question; isn’t mother earth so wise, ancient and versatile? She has always proved to be a reliable companion to the flora and fauna. Man, however lives in the present and pays no attention to the future and the long term impacts of mining. Morning Shadows, Rosie Lloyd-Giblett, ink , graphite on paper, H 90cm x 70cm, photo by Tonia Cecil. 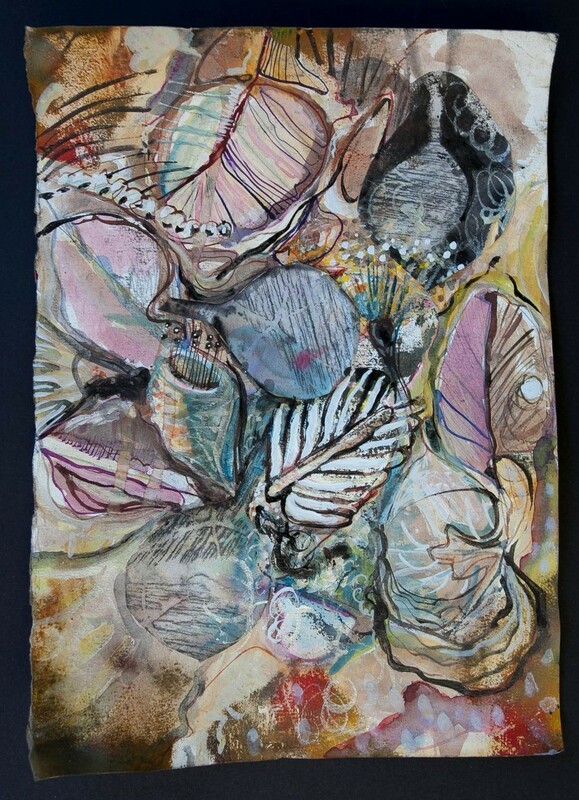 Hollows in the fallen timber – Bimblebox, Rosie Lloyd-Giblett, collage on paper, H 42cm x 52cm, photo by Tonia Cecil. 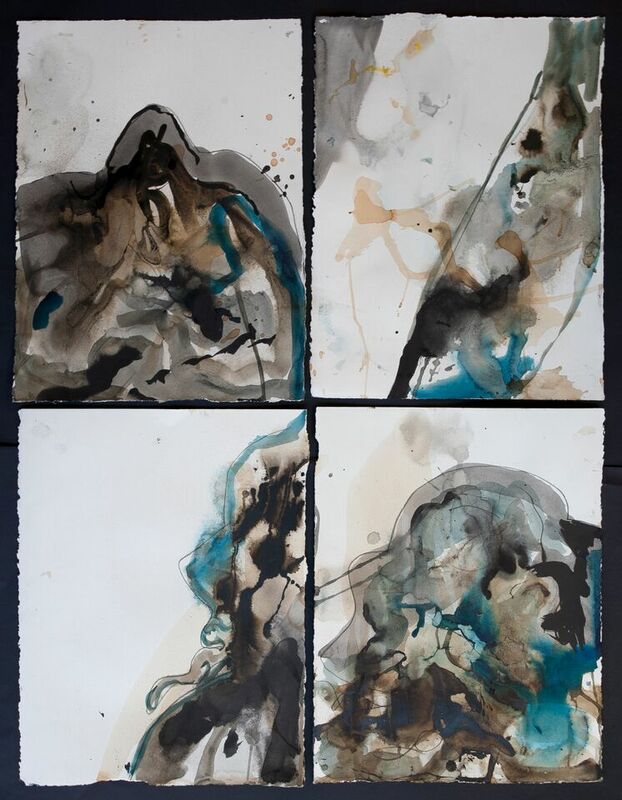 The works created during this sojorn were plein air style, contour drawings and aerial like paintings. I used my own shadows and the moving canopy to create many works. The silhouettes of leaves and figures suggests the inter-connected tangled web of sediment, land and water. 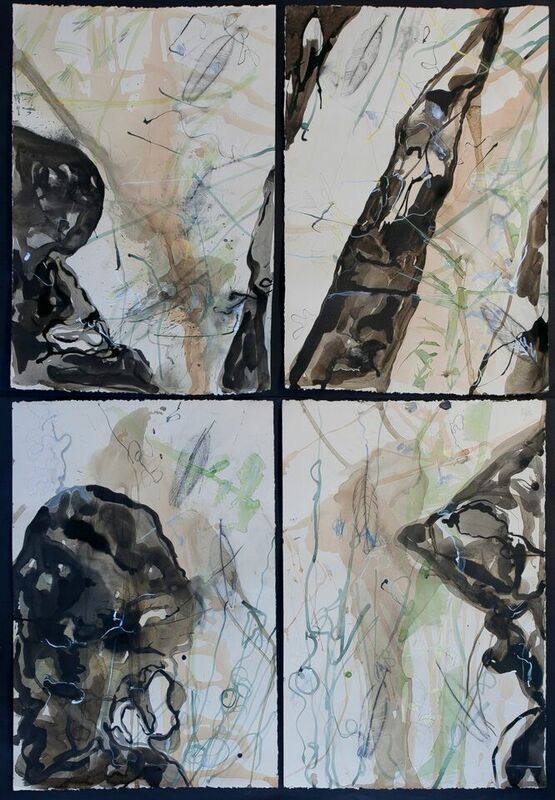 Grandmothers tree, Rosie Lloyd Giblett, ink, charcoal pastel on paper, H 120cm x W 200cm (Concertina), photo by tonia Cecil. 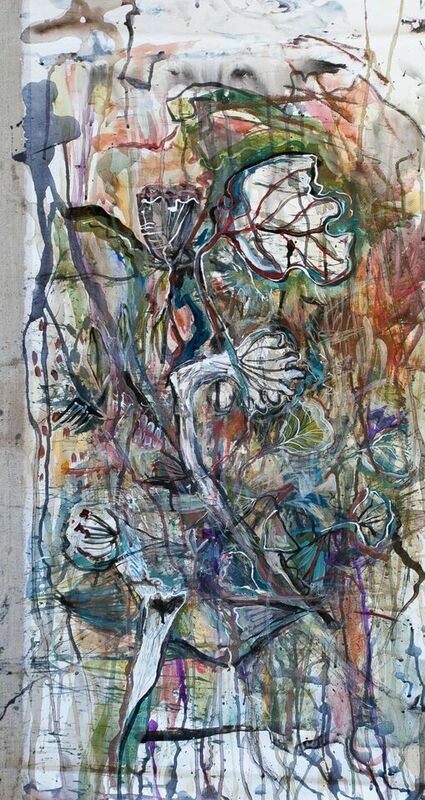 From the oldest to the poplar, Rosie Lloyd-Giblett, ink, acrylic and charcoal on canvas, H 60cm x 230cm, photo by Tonia Cecil. Dawn to dusk at Bimblebox, Rosie Giblett, monoprint, watercolour on paper H 45cm x 90cm, photo by Tonia Cecil. I love “Dawn to Dusk”!! All your work shows the subtle peace of the place combined with your own energy. Love the colours Rosy.